Israel working to block EU resolution that emphasizes the distinction between Israel and "settlements". Israel's Foreign Ministry is making last-ditch efforts to block a pending European Union (EU) resolution that emphasizes the distinction between Israel-proper and the territories it captured during the 1967 Six Day War, Haaretz revealed Friday. Adoption of the resolution could lead to new sanctions against Israeli communities in Judea and Samaria, senior officials in Jerusalem and European diplomats told the newspaper. The resolution is expected to be published on Monday, at the conclusion of the monthly meeting of the Foreign Affairs Council, comprising the foreign ministers of the 28 EU member states. It was initially expected to be relatively moderate, but the draft's wording got increasingly harsh with regard to Israel during Thursday's session at EU headquarters in Brussels, according to senior Israeli officials who spoke to Haaretz. The draft stresses the distinction made by the EU between Israel and the “settlements”, saying, "The EU will continue to unequivocally and explicitly make the distinction between Israel and all territories occupied by Israel in 1967." 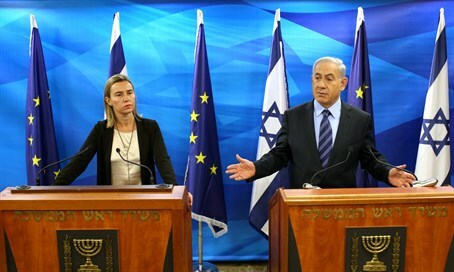 "EU agreements with the State of Israel are only applicable to the State of Israel. The EU and its member states are united in their commitment to ensure full implementation of existing EU legislation and agreements applicable to settlement products. The EU reaffirms its decision (to label products from Judea and Samaria -ed.) and doesn’t consider it a boycott of Israel, which the EU opposes," the draft continues, according to the text released by Haaretz. The draft says the EU will consider taking steps to save the two-state solution. "The EU will continue to closely monitor developments on the ground and their broader implications," says the draft. "The EU will consider further action to protect the viability of the two-state solution, which is constantly eroded by new facts on the ground." It backs France's suggestion that an international support group be established to promote the Israeli-Palestinian peace process and to convene an international peace conference in order to restart regional, multi-sided negotiations between Israel, the Palestinians and the Arab states. The draft also includes an indirect reference to the NGO bill promoted by Justice Minister Ayelet Shaked, and even equates Israel's conduct regarding NGOs with that of the Palestinian Authority. "The EU is concerned at attempts to stifle civil society on both sides," it says, according to Haaretz. A senior official in Jerusalem told the newspaper that Israeli ambassadors in all the European countries as well as those in the EU institutions in Brussels had worked throughout Thursday and Friday in an effort to soften the draft resolution being promoted by Sweden, Ireland and, to an extent, France. But as of now, that effort has not met with success. "The drafts have become increasingly harsh and grave from moment to moment," the Israeli official told Haaretz. "The Swedes and Irish are pushing and it appears as if our friends are not able to withstand it. The Germans are trying to hold the line, but are not succeeding." Officials in Jerusalem stressed that acceptance of the resolution in its current form would lead to severe consequences, and could bring about increased sanctions against Jewish communities in Judea and Samaria. As noted in the draft resolution itself, it follows the EU’s recent decision to label Israeli products from Judea, Samaria and the Golan Heights as “settlement products”. Many experts have warned that the labeling is only the first step leading to a total boycott of Israel, particular given the active role of Boycott, Divestment and Sanctions (BDS) boycott groups in getting the labeling passed. Following the labeling decision, Prime Minister Binyamin Netanyahu instructed the Foreign Ministry to reassess its involvement with EU institutions regarding the political process with the Palestinians, in the wake of the labeling decision.